I have a best friend who is in graphic design and she offered to make our template for our invitations. That's not even the best part. Staples quoted us on 200 invitations... 30$. Reply postcards... about 10 bucks! Definately check them out. Sure beats paying $20.00 for 25 invitations at Walmart. This could not have come at a better time. checking both out right now. Target, Walmart, Office Max, and Michael's all have nice printable invitations. My sister-in-law used print them yourself invitations and they looked great! 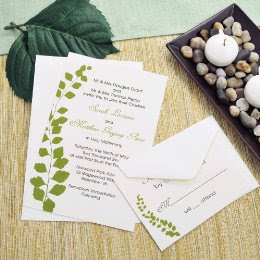 Besides most people don't spend as much time looking at your invitation as you do...so simple is good. I'd never know those were from Target. They're beautiful. We used 123print.com. It was only about 30 bucks for 75 custom invitations (with our engagement picture as a background) and envelopes with our return address printed on them (time saver!). It's also only a couple more dollars to have them printed on recycled paper. We used this site for our save the date postcards as well, and it's only 9.95 for 50 or 14.95 for 100. We joined their email list and got a free shipping code and saved even more! This may be a good option if you forsee a future battle with your printer trying to print them yourself like I did! Initially I tried to go the design our own route, but if you aren't a graphic designer and don't know one, it starts to become more hassle than it's worth (at least to me!) We ended up with a set if DIY invites from Michaels that I got with 40% off coupons. They weren't my favorite, but I have a hard time being very detail oriented. We got great compliments on them and in the end, it didn't matter! No one could tell they were 70cents a piece! And my bank account was definitely pleased! Love the invitations from Target, we used them for our wedding last October, had a little trouble with printing them on our regular printer, but my husband ended up taking them to work and printing them on his laser printer. Not sure if all of Target's line would be difficult to print, ours had a texture to them and it made the ink smear. We used one of the invitations from Target from the Letter Impress line. Simple to use, beautiful and budget-friendly. We received lots of compliments and everyone thought they were custom made designer invites.